Following this blog as religiously as I'm sure you all do, you know that from time to time I get pissed off at the service I receive and use this blog to vent about it. This isn't one of those posts. For the last few years I've had a dedicated host at CoreNetworks.net. I host my PEAR channel, my private Git repositories that I use to share things between computers, and a few miscellaneous things on the server. There's nothing major there, but there's a lot of stuff I don't want to lose. My server runs Ubuntu Server Edition. For what I use it for, it's great. The packages stay up-to-date, the server keeps itself running, I'm happy. I was going on 6 month uptime cycles. Up for 6 months, do a distro upgrade, reboot, and be up for another 6 months. For whatever reason, I didn't get this last upgrade in. Sunday, I decided to fix it. I checked the upgrade process to make sure it hadn't changed. Sure enough, it hadn't. A quick sudo do-release-upgrade and I was off to the races. That's when it all started. My root partition was full. I started poking around to find out what was filling it up. All of the usual suspects were on their own partition and had plenty of room. I'd only allocated 500Mb to my root partition as I thought nothing important was going to end up on it. After a few minutes of investigation I found the /lib directory. It was taking up a little over 80% of my 500Mb. Simple enough fix. A quick mv /lib /usr/lib2 and a ln -s /usr/lib2 /lib and I would be done. No harm in that. Or so I thought. As soon as the mv finished, I went to create the symlink and got an error. ln wasn't found. I tried an ls and got the same message. At that point I got a sinking feeling in the pit of my stomach. cd still worked, but not much else. Anything that's part of Bash was gone. Now panic started to set it. For those of you who follow me on Twitter, you'll recognize that I was a little miffed. I keep cursing to an absolute minimum on my Twitter account. Sure, I've only got 140 characters to fill with an update, but I don't have to be so lazy that I can't come up with something other than cursing to fill a post. 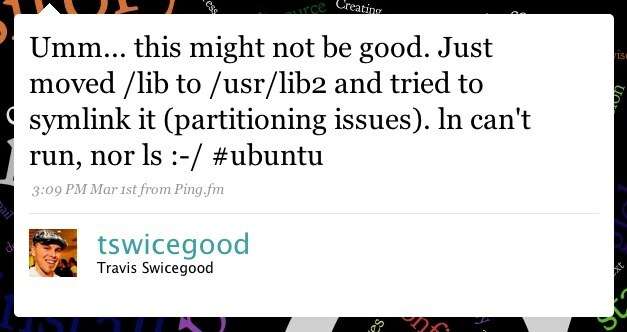 I hopped on the #ubuntu IRC channel and asked what my options were. Boot to a LiveCD was the only semi-helpful answer I got. The server's located in California, so that's why it's only semi-helpful. It's not like I can pop a CD in the drive and reboot it. My favorite response was someone trying to be clever with their "that's much more creative than rm -rf /" comment. Sure, in retrospect it was, but that's not the answer I was looking for at the time. I called a buddy of mine who's a sysadmin, and T2 and Eric showed up at my front door. They'd seen my prolific cursing in a private IRC channel and wanted to come over and heckle—err, I mean help. 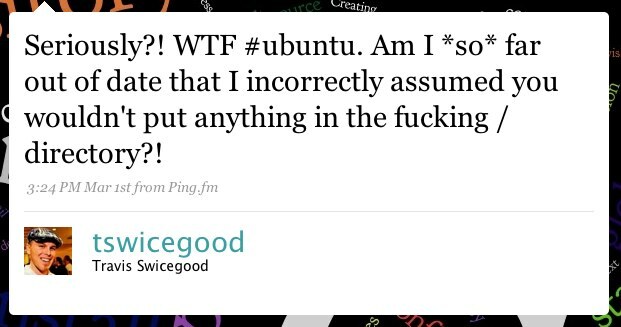 Now, to bring this back full circle to CoreNetworks. I determined my best bet was going to be the LiveCD via KVM. It basically lets you act like you're sitting there with a keyboard, video (i.e., monitor), and mouse hooked up to the machine. I checked the CN website looking for a phone number and couldn't find one. I fired off an email to their support email address asking if it would be possible to get a KVM instance going with a LiveCD and asked them to please call my cell if it was possible. I need to back up just a minute to bring you fully up-to-date. Unless you've clicked on one of the links to CoreNetworks, you probably haven't heard of them. They're a dedicated hosting provided that provides excellent prices on dedicated machines. They have one server that starts at $29.95 a month! When I first started having web sites hosted, that's how much it cost for a shared account! They don't offer lots of fancy extras, and it's just a plain ol' box. They're not bottom of the barrel on prices, but they're nowhere near the top. Their network is reliable, I've never noticed any major downtime on it. All of this for a really reasonable price. I don't have their $29.95 server, I pay a few bucks more for one of their upgraded machines, but it's still very low for what I get. I've never had an urgent request go in to support in the time I've been using their service. At that, I think the only reasons I've ever contacted them were billing related (credit card expired and one time they randomly shut me off for an hour saying I hadn't paid my bill when I had). I had no idea how my email would be received. I honestly didn't expect a response until Monday. About 5 minutes later I got a call from a number I didn't recognize. My heart jumped at the thought it might be them. Sure enough, one of the guys in support had seen my email and was wanting to verify what I wanted, then set off to get it going. Another 5 minutes and I had an email with instructions to connect to my KVM and told me that the LiveCD was loaded! With that, it was a few quick commands to get the files back in the right place and reboot and it was done. Piece of cake with the KVM+LiveCD, but still, my heart skipped a few beats when I realized what had happened right after I saw that first error message. This was amazing customer service, though. These guys won a customer for life by going above and beyond my wildest expectations for them. This is all from a provider that doesn't have a flashy web site. They don't push anything as whiz-bang or the latest gizmo. I doubt the words cloud or elastic appear anywhere on their site. I've never noticed a banner ad for them on any of the development websites I frequent. The only time I've ever heard mention of them is when a friend of mine pointed me in their direction saying that they offered solid services at a great price. I've always recommended them to friends when they ask about hosting. Given this past weekend's experience, I wanted to recommend them to a broader audience. I can't recommend CoreNetworks highly enough if you have a need for a dedicated server. It's reliable, and, should you need it, their support is excellent.